A Foaling Alarm on your Smart Phone. Smart phones include the sensor required to identify when a mare is in the foaling position (laying down on her side) and can communicate with other smart phones via the mobile network and Wi-Fi. 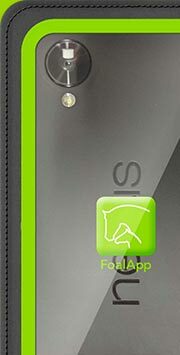 Foal App utilises this sensor, creating a foaling alarm on a smart phone. A phone is attached to your mare's halter in a specially designed protective pouch, and using Foal App, will send an alarm to your phone if she lays down. This alarm includes a live video stream from the phone on your mare, so you can see what she is doing and hear her as well. This eliminates the need to physically check on your mare in case of "false alarms" (if your mare lays down when she is not in labour). Foal App also allows you on-demand access to the video streaming from the mare's phone at anytime. Multiple mares can be monitored on your phone, and multiple people can receive alerts from a mare. Setting up Foal App is easy!